The new online shop is now up and running, but work doesn’t end there. Our next big improvement coming your way will be especially interesting for computational chemists. We are making a screening compound online sourcing tool. 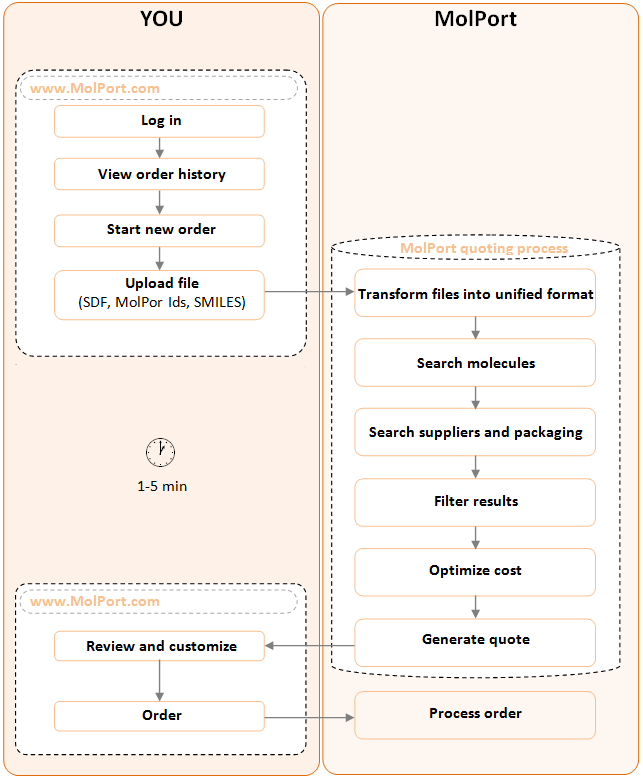 You can already order screening compounds via MolPort the old way, but wouldn’t it be nice to be able to have a shopping cart big enough for purchases like long lists of screening compounds where you can easilly overesee what’s in it!? Let me give you a first look into what’s coming. Before you continue, however, let me tell that we are also looking for volunteers that would like to test it and help us make the user interface intuitive and easy to use. You can register here to participate by marking the I want to use the screening compound sourcing tool box in the registration page. To use this service, you need to be a registered MolPort user. When you log in to your first page you will be able to see all requests you have made. To start a new request you will have to upload an SDF file or Text, CSV or Excel tables with SMILES strings or database IDs (MolPort, ZINC, PubChem, etc.) and specify order details (required quantity, lead time, stereochemistry, format, etc.). If your order is large, it may take few minutes for our sourcing engine to do its magic and to fill your shopping cart. There will be no need to wait around. While we process the file you can review other requests or simply close your session and return later to see the calculated results (we will send you an email notification when it is done). This is the really interesting part. Once the sourcing engine will finish it’s job, you will see right there on your screen how many compounds are availabe and how many are not. The screening automaton, as we call it, will also calculat the final price for you. And not just one final price. In addition to the one that’s optimized MolPort style – the MolPort recommended, you can also see how the prices and delivery times look sorted by lowest price or smallest number of suppliers. As time goes on there will be more and more options for customizing your final offer, but more on that you will be able to read in another post. As usual, once you have decided on which calculated option to choose, a simple check out process will set things into motion to deliver your compounds to you. And that is really all about. No more need to email suppliers or MolPort. In one short session you will be able to go from your original compound list to a finished order. Liked what you saw? Of course, nothing is written in stone yet so if you are interested in being among the first to test drive the new tool and help us make it exactly what you want it to be, come register here by marking the I want to use the screening compound sourcing tool box and participate.